ARMENIAN, GREEK, AND TURKISH YOGURT - HOW TO MAKE THE THICK TYPE OF YOGURT AT HOME AT A FRACTION OF THE PRICE YOU WOULD HAVE TO PAY FOR GREEK STYLE YOGURT AT THE SUPERMARKET. As one of Armenian ancestry, I had heard stories of the difficulty in bringing in, through U.S. customs, the bacterial culture that is needed to make yogurt. As immigrants were processed at Ellis Island, the INS officers would look at the little jars of yogurt starter carried by the immigrants. They would have most certainly opened the jars and smelled the sour, acrid odor of the bacterial culture. It was of course immediately thrown into the trash. In correspondence to the old country, one Armenian immigrant bemoaned the fact that they could neither buy or make this diet staple they had enjoyed for centuries. An enterprising woman in Turkish-Armenia, who was shortly leaving for America, came up with a solution to the problem. She took clean white handkerchiefs and dipped them into a large bowl of yogurt and then hung them out to dry. She then carefully folded them with her other linen and packed them in her trunk. After she got to the U.S. she had no difficulty in going through customs with clean white hankies. Once settled, she dipped these hankies in warm milk and thus freed the bacteria to culture and make yogurt. Yogurt is a very healthful milk product and is really the precursor to making cheese. You can drain Yogurt of the whey and have a very high quality cream cheese. It has for centuries been a cure for ulcers and just recently used in the replenishing of bacterial flora in the digestive tract after extensive antibiotic therapies which deplete the body of good bacteria as well as the bad. ●  ½ gallon homogenized cows milk, sheeps milk, or goat milk. 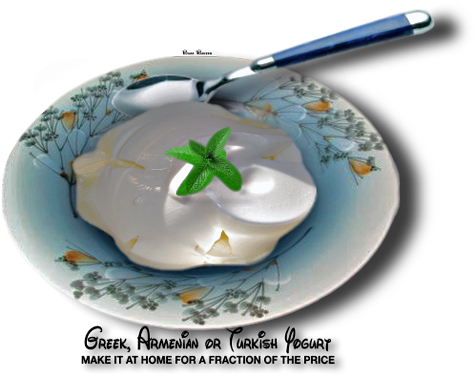 ●  ½ cup yogurt (starter)**SEE COOK'S NOTES - 1**You can use up to one cup. ■   1 Large 1 gallon stainless steel pan to heat a ½ gallon of milk. in the skin into the 105°F milk, being careful not to break up the skin. away from the fruity flavored varieties ad they may not work as a bacterial starter. what Greek yogurt would cost you at the supermarket. It's worth the extra 24 hours of wait time.